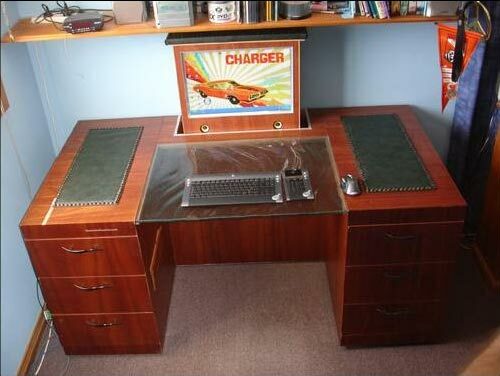 Check out this amazing desk with a built in PC from moder Chris Samson. ¢â‚¬¦ essentially its a desk that i made, then i put the computer in a drawer and enclosed a 22″ widescreen LCD in the middle and put the LCD on an actuator. so all i do is push a button and the computer turns on and at the same time the actuator raises the screen. i made this between January to November 2007. it was part of my final year of high school for design and technology project here in Australia! This is an awesome mod, and it looks like Chris put a serious amount of work into this project, I love the way the screen disappears into the desk.